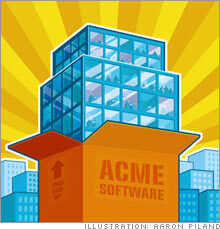 Organizational software that was once out of reach for small companies has become more affordable. (FSB Magazine) -- For a company that sells flame-resistant apparel to oil companies, Vetco International was having a tough time putting out its own fires. For years the Orlando-based manufacturer had relied on a hodgepodge of software applications, including Microsoft Office Access, Microsoft Word and Intuit QuickBooks, to track its purchasing, accounting and warehousing activities. Vital business data were distributed among all the applications, few of which communicated easily with the others. 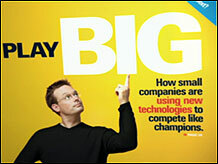 Small companies are using new technologies to compete like champions. The result was that the 30 employees of Vetco (vetco-international.com) often misplaced product shipments, overlooked clients' requests for quotes and failed to invoice more than $4,000 worth of sales on a monthly basis. "Not only was it embarrassing," says Jose Barrios, CIO of the $6-million-a-year company, "but our cash flow was restricted." Vetco decided to replace its software potpourri with an enterprise resource planning (ERP) system. ERP is a broad term for any software application that integrates (or tries to integrate) all your processes and data into a single unified system. Once reserved for big corporations, ERP applications are gaining traction among entrepreneurs who need real-time insight into sales patterns, merchandise availability, cash flow and the like. More than a million small businesses worldwide implemented an ERP system last year, according to the Framingham, Mass., research firm IDC. Yesterday's ERP systems carried seven-figure pricetags and required painful two-year deployments, not to mention battalions of expensive IT consultants to keep them up and running. Today's products can be deployed in a few weeks and are far less likely to crash. And the overall cost of ERP services has dropped 40 percent over the past five years, estimates Forrester Research analyst Ray Wang. Microsoft (Charts), SAP (Charts), and Sage Software rank among the leading small-business ERP providers today. Each has different strengths and weaknesses, according to business owners and analysts. Microsoft provides strong analytic tools but can impose hidden costs. SAP delivers comprehensive ERP out of the box but can limit user flexibility. Sage allows clients to pick from an � la carte software menu, at the risk of integration headaches. Barrios considered Microsoft's Dynamics GP but balked because the basic system couldn't handle core tasks such as answering customer quote requests. "Everything we wanted to do was an extra feature from another vendor," says Barrios, 39. Instead, he picked SAP's Business One package. For an upfront price of $120,000 and annual maintenance fees of $8,000, Business One converts his quote requests into sales orders, generates purchase orders for suppliers, keeps tabs on shipments and invoices customers with a single mouse click. But unlike Dynamics GP and Vetco's original accounting system, Intuit (Charts) QuickBooks, Business One doesn't allow users to delete financial transactions once they have been entered into the system. This feature came as a shock to the company's accountants, who suddenly found that they couldn't delete mistakes without the help of a network administrator. But for Barrios the feature is an unalloyed benefit. "Think Enron," he says. "Now we have traceability and accountability." By replacing stacks of paperwork with a single piece of software running over a common database, Vetco was able to avoid hiring three additional workers to accommodate the company's growth over the past two years. That savings alone - roughly $126,000 a year, including bonuses and benefits - allowed Vetco to recoup its ERP investment after little more than a year of deployment. Another small firm, Carrier & Gable, posted similar savings by adopting Microsoft's ERP system. Carrier & Gable (carriergable.com) sells traffic lights, street signs and other road safety products. Based in Farmington Hills, Mich., the firm has 30 employees and nearly $25 million in annual revenues. Carrier & Gable produces customizable kits made up of parts from multiple suppliers: A streetlight kit, for example, would include poles, lights, wires to connect the lights and so forth. But because the company's old IBM (Charts) accounting software couldn't itemize the component costs of each kit, Carrier & Gable couldn't tell which components were more popular and had little idea how much gross profit (revenue minus component costs) it was earning on each kit sale. Over the years, Carrier & Gable hired consultants to generate detailed reports that calculated the gross profit generated by each kit. The consultants charged $25,000 a year for these reports. But their estimates were often off by $100,000 a month, mistakes that the company could catch only by comparing the reports with its monthly income statements. In 2003, Carrier & Gable plunked down $105,000 to license a Microsoft ERP product called Dynamics NAV. CFO Ken Zavela, 53, liked the familiar Microsoft interface. And because he was used to programs that require plug-ins from outside vendors, he wasn't intimidated by the prospect of having to buy extra software. Microsoft Dynamics NAV allows Carrier & Gable to create sales reports that calculate component costs and gross profit from each kit sale to "within a penny or two," says Zavela. That insight allowed the company to eliminate $100,000 worth of slow-moving components that were costing it $5,000 in annual warehousing fees. As a result Carrier & Gable recouped its ERP investment within two years of deployment. In Tucson, Horizon Spa & Pool Parts opted for a Web of Sage ERP applications: Sage Pro ERP for book-keeping, Sage Accpac CRM to manage merchandise returns and Sage Accpac Warehouse Management System for inventory. Horizon (horizonspaparts.com) spent about $250,000 in licensing and implementation fees. Annual maintenance charges total $30,000, not cheap for a company with less than $15 million in annual revenues. And the applications run on separate databases. But the system organizes nearly every aspect of Horizon's business. Six salespeople log over 600 orders a day. The system staggers order flow so that warehouse workers are no longer inundated with orders at the end of each day. Horizon now knows exactly what items are in stock and where to find each one. Warehouse errors are down 50 percent, says Horizon GM Raymond Thibault. And Horizon saved $358,000 in labor costs over the first two years - more than enough to cover its ERP investment. Have you tried enterprise resource planning software to streamline your business? Please send comments to fsb_mail@timeinc.com.